The CMCRF provided seed-corn funding project for this project conducted at Aberdeen University. 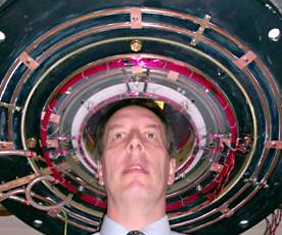 The purpose was to research the possibility of a low cost/low field MRI. Whole body scanners are expensive to buy, house and maintain. The result: too few scanners, high demand and long waiting lists. The aim was to develop a low-cost, widely available machine, capable of imaging particular parts of the body, e.g. head or breast.